An “accepted” or “covered illness” refers to any illness determined by the Department of Labor to be caused by exposure to radiation or toxic substances during work at a Department of Energy atomic weapons facility. The easiest method to determine which illnesses have been accepted is to look on the white card you should have been issued upon approval of your claim. 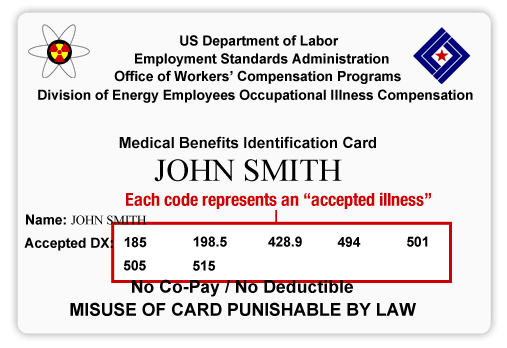 The numbers highlighted by the red box above correspond to different “accepted illnesses.” For example, the code 501 is associated with an asbestosis diagnosis. To look up the corresponding illness you can use Find A Code. It’s important to understand the codes and underlying diagnoses on your card to determine which costs your EEOICPA benefit will cover. In the example above, any medical cost related to asbestosis (501), will be covered by the Department of Labor. That includes doctors’ appointments, medications, in-home care and more. Illnesses not listed on your white card will need to be paid with another payer source. In some cases you may have an illness you suspect is from your exposure, but not listed on your card. Or, you may have a condition that was caused by treatment for an accepted illness, but isn’t listed on your card. For example, if you developed cataracts because of chemotherapy treatment for an accepted cancer diagnosis, the cataracts would be considered a consequence of your cancer treatment. Cataracts would be eligible to be added to your card and all costs associated covered. You will need to submit a new claim to get codes added to your card. Remain at Home is a proud to serve nuclear workers under EEOICPA. Call us today at (800) 718-5658 or use the form below!